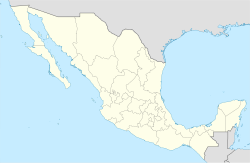 Chetumal (Modren Maya: Chactemàal /tɕʰaktʰe̞mɐː˨˩l/ which means: "Place o the red firth") is a ceety on the east coast o the Yucatán Peninsulae in Mexico. It is the caipital o the state o Quintana Roo an the municipal seat o the Municipality o Othón P. Blanco. In 2010 it haed a population o 151,243 fowk. The ceety is situatit on the wastren side o Chetumal Bay, near the mooth o the Río Hondo. Chetumal is an important port for the region an operates as Mexico's main tradin gateway wi the neebourin kintra o Belize. Guids are transported via a road connectin Chetumal wi Belize Ceety tae the sooth, an via coastal merchant ships an aw. Acause o its location on the Caribbean coastline, it is vulnerable tae tropical cyclones; Hurricane Janet an Hurricane Dean, baith Category 5 storms, made landfaw near Chetumal in 1955 an 2007 respectively. In Pre-Columbie times, a ceety cried Chactemal (sometimes rendered as "Chetumal" in early European sources), probably the day's Santa Rita in Belize, wis the caipital o a Maya state o the same name that roughly controlled the soothren quairter o modren Quintana Roo an the northeast portion o Belize. This oreeginal Chetumal is nou believit tae hae been on the ither side o the Río Hondo, in modren Belize, no at the steid o modren Chetumal. Durin the Spainyie conquest o Yucatán, the Maya state o Chetumal focht aff several Spainyie expeditions afore feenally bein subjugatit in the late 16t hunderyear. The 1840s revolt o the indigenous Maya fowks against Mexican rule, kent as the Caste War o Yucatán, drove aw the Hispanic fowk frae this region; maony settled in Breetish Honduras (modren Belize). The current steid o Chetumal wis established as a Mexican port toun in 1898, oreeginally unner the name Payo Obispo. The name wis offeecially chyngit tae Chetumal in 1936. Twa hurricanes in the 1940s leveled the entire toun; Chetumal wis devastatit a third time in 1955 bi Hurricane Janet. Efter this, the toun wis rebuilt wi mair solid construction, wi concrete blocks replacin firth as the uisual material. The population o Chetumal wis smaw (aboot 5,000 in 1950) till the construction o heich-gates linkin it tae the rest o Mexico in the 1960s an 1970s; the ceety then boomit wi substantial migration frae ither pairts o Mexico. Cultural Centre o the Fine Airts (Centro Cultural de las Bellas Artes), locatit in the centre o the ceety. The biggin is hoosit in wis the schuil Belisario Domínguez, which wis the first schuil o Quintana Roo. Museum o the Mayan Cultur (Museo de la Cultura Maya), considered the lairgest an maist comprehensive museum in the state dedicatit tae the Mayan cultur. It haes a important collection o authentic an reproductions o clessical wirks, an tells the development o Mayan cultur, its oreegins, as well as various aspects o their daily life. Museum o the Ceety. Tee'd tae the Cultural Centre o the Fine Airts, dedicatit tae the exhibition o photographs, tuils an documents that tell the story o the foondin o the ceety. Monument tae the Flag (Monumento a la Bandera), the first monument built in Chetumal. It consists o a white obelisk that haes a clock dial on each o its faces. Cradles o the Meztizaje (Monumento Cuna del Meztizaje), constructit in the entrance o Chetumal. It haes the shape o a Mayan pyramid on which are the statues o Gonzalo Guerrero, his wife Zazil Há an the childer o baith. Andrés Quintana Roo Memorial, dedicatit tae Andrés Quintana Roo, whom the state wis namit efter. Monument tae the Fishermen, ane o the maist recent, locatit in the Bay o Chetumal. ↑ Carrillo, Manuel. Dean pummels Mexican resorts, Reuters Canada, 2007-08-21. Accessed 2007-08-21. ↑ Belize Tourist Board. "Santa Rita". The Belize Virtual Guide. Naturalight Productions Ltd. Retrieved 14 August 2011. ↑ Association for Belizean Archaeology (1989). Foster, Byron, ed. Warlords and maize men: a guide to the Maya sites of Belize. Cubola Productions. ISBN 978-968-6233-06-3. ↑ Historical Weather for Chetumal- Airport, Weatherbase. Retrieved July 17, 2012.